The Addmen OMR software is based on advanced OMR technology that can read and evaluate the OMR sheets automatically, by correlating the answer responses with the defined answer key. Both, the OMR answer sheet checker and OMR form reader software come integrated with the OMR sheet designing feature. Moreover, you do not have to pay anything extra to buy this special feature. It is an inbuilt facility with the software. The OMR designing facility has made the OMR sheet designing process very easy. You can design different layouts of OMR forms and OMR answer sheets using the OMR software. There is no need to rely on a designing expert for this purpose. Many people think that only sheets with OMR bubbles and grids can be made with this designing feature. This is not true. There are several things that you can add to your OMR sheet. 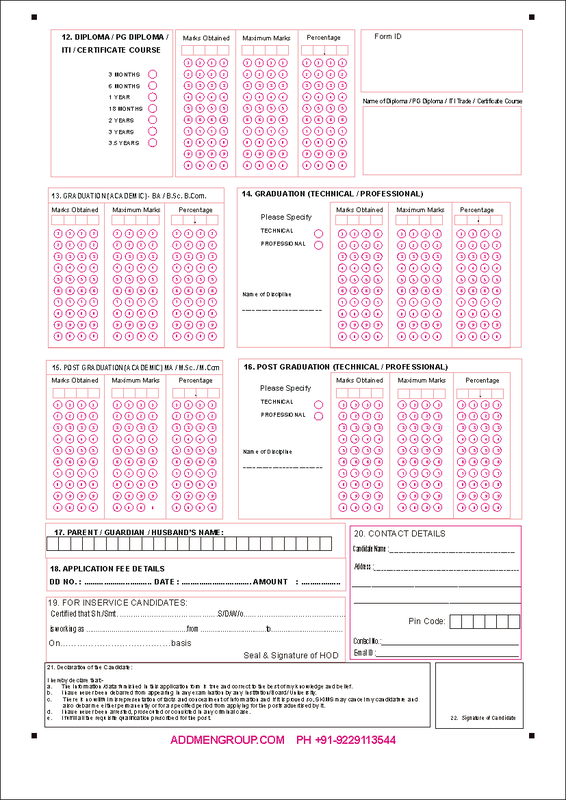 OMR forms like admission forms and attendance forms need the students or individuals to paste a photograph somewhere on the sheet. This image space can be designed using the software. Image blocks can be placed anywhere on the OMR sheet as per your requirement. When the OMR software reads the sheet, the image or photograph pasted in the space provided gets embedded in the software's database. There is no special requirement for printing and scanning the OMR sheet with image. You can use a regular inkjet or a laser printer, and an image scanner for these purposes. Scan the sheets at 150-200 DPI so that the image is scanned clearly and properly. When the OMR software reads this sheet, it reads the image, text as well as the OMR bubbles at once. You do not need to run the software separately for image and OMR bubbles.